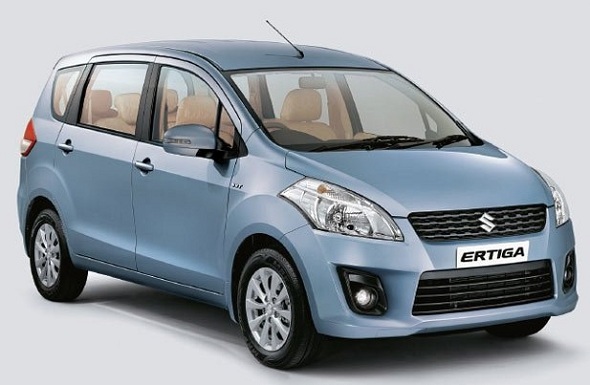 Maruti has just launched two new variants of the Maruti Ertiga – the much-expected CNG-petrol dual fuel model, is now available on the Maruti Ertiga LXI CNG and Maruti Ertiga VXI CNG variants. These two variants are priced at Rs. 6.52 lakh and Rs. 7.30 lakh ex-showroom Delhi respectively. What’s different with the Maruti Ertiga Green? The Maruti Ertiga Green is about Rs. 53,000 more expensive than the regular Maruti Ertiga petrol variant. However, it does bring down running costs by quite an extent for those who use the Ertiga only in the city, as the cost of CNG is just about Rs. 40 per Kg, while petrol is nearly Rs. 67 per litre after the recent price hike. Also read: Renault Duster vs. Maruti Ertiga: Which is the car for you? The Maruti Ertiga CNG claims a fuel efficiency of 22.80 Km per Kg of CNG. Maruti says the system is fitted on the assembly line itself, which makes it integral to the car, unlike an aftermarket system. The engine too has been tweaked to accept CNG. Maruti calls it an iGPI system with a dual engine control unit (separate ECU for the CNG system), which is what you get with high-end sequential CNG kits anyway. The Ertiga Green is powered by a 1.4 litre four-cylinder petrol engine, with an add-on CNG injection system. In petrol mode it puts out 94 bhp of power at 6000 rpm and 130 Nm of torque at 4000 rpm. In CNG mode, expect a 15% drop in both power and torque figures. There are no visual changes to the vehicle, other than a “Green” badge and CNG sticker on it.